An arcade real-time strategy game by Pocketwatch Games, featuring old-school pixel art visuals. Tooth and Tale is an arcades real-time strategy game for PC and PS4 by Pocketwatch Games, the creators of the award-winning Monaco: What's Yours Is Mine. The developers’ goal was to create an RTS that puts an emphasis on strategic creativity instead of quick, difficult, StarCraft-style management. 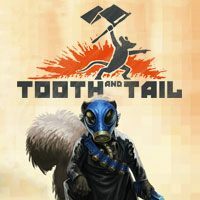 Tooth and Tale takes place during an animal revolution similar to the conflicts of the turn or 19th and 20th century, where mustard-gas-skunks, boars with flamethrowers, fox snipers, and warlike mice fight to the death. As you might guess, several factions take part in combat, and their armies consists of various species of animals. At the first sight, Tooth and Tail for PC and PS4 resembles a classical RTS that focuses on gathering resources, building a base, and tactical combat. However, contrary to most real-time strategy games, we do not issue direct command to individual units. Instead, we assume control over of a mouse leader of our choosing who moves throughout the battlefield with a banner in his hand. His tasks include designate places for buildings, rallying armies, and showing his subordinates their target. Since we control just one character, the controls resemble action games: we move on the map with the buttons of a gamepad or with WASD keys on a keyboard and rally units with a mouse. Thanks to such solution, many processes that usually the player has to oversee are automated in Tooth and Tail, letting us fully concentrate on the action. Tooth and Tail for PC and PS4 offers a story campaign for one player and a multiplayer mode in 1vs1 and 2vs2 variants (online or on a split screen). Matches are usually short and last from several to over a dozen minutes. Tooth and Tail’s graphic style is based on the popular pixel art style that resembles the production of the 90s. Two-dimensional levels are observed from a classical isometric camera. The gameplay is accompanied by a dynamic, light instrumental folk music.